Creating my everyday: Eye candy time! So, before I show you the gorgeous AMM kit that is pure eye candy, I have the last of my JBS projects to share. This layout is about my sister-in-law and me. Journaling reads: We weren't born as sisters, but we became sisters when I was 21 & Terry married my brother. She's the sister I never had, and I feel so blessed to have her in my life. I'm sure you all recognize that handsome boy! ;-) Journaling: I love your originality, Noah. Always stay true to who you are - always be you! 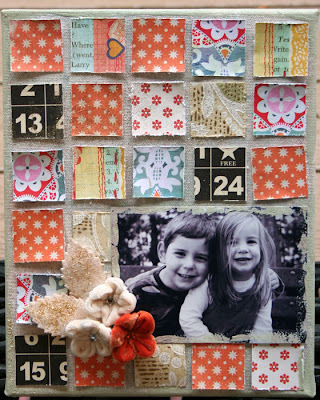 And the last of my six projects is a canvas I made with my scraps from the kit. I first sprayed glimmer mist and added glitter to the canves before I added my squares. I added some more glitter on top after I put the squares down (i'm not too glitter crazy, am I? ;-), and I painted some TH crackle paint around the edges of the photo and the canvas. Can't wait to hang this up! Thanks again to JBS for having me as the October guest - it was an honor and a blast!! 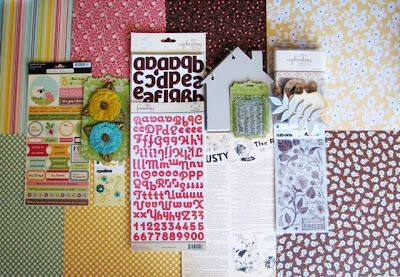 Now, onto the eye candy.... this is October's kit for AMM, and I am sooo excited to play with mine! I should be getting it any day now. 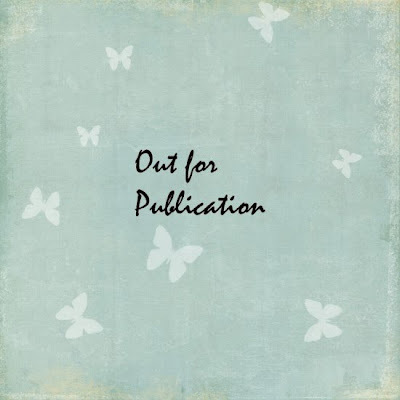 The papers are Jenni Bowlin and October Afternoon, and the letters and embellies are a mixture of October Afternoon, Pink Paislee, Prima, Basic Grey, Creative Imaginations. If you want to check it out in greater detail, go here. Well, I hope you all are having a wonderful weekend so far! One of my closest friends is getting married tonight, so I can't wait for the wedding! It's been a long time since we've had a night out without the kids, too, so i'm sure we'll enjoy some adult time! Happy weekend, everyone! 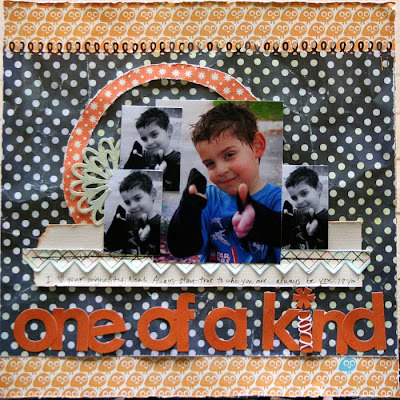 I love these and your layers YAY me love me love .. and the colors you mixed together are amazing .. the first one is so good love that .. and the title is amazing ..
Wow, you are rocking the Jenni Bowlin, Staci! Enjoy yourself at the wedding tonight, kick up your heels, girl! 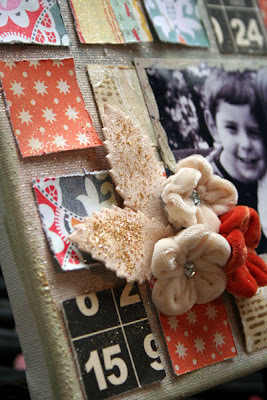 Fabulous layouts, Staci and that canvas is gorgeous! BEAUTIFUL LO'S!!!!!! I so love all of them! Enjoy your Sunday and have fun tonight! Oh Stacey....I love these LO's...so much wonderful detail and dimension....so full of LOVE!!!! I just adore your talent!!! Wishing you a wonderful day!!! I so love what you did with the JB stuff. You sure put the "umpfh" into her product. My fave has to be the canvas - it just so rocks my world. 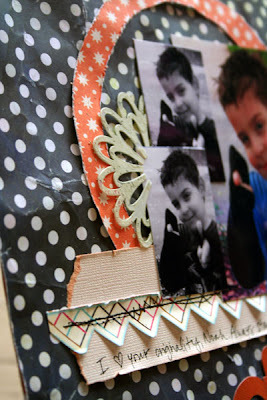 Love the layers on these layouts and the canvas you made Staci! What a great idea with the "quilt" pieces and covering the canvas with glimmer mist..It is perfect for display on the wall for sure! I LOVED all your newest LO's; just loved the one of Noah by himself, I don't recall seeing that picture of him and the one of you and Terry. I SO LOVED the canvas, can't wait to see it hanging up. Everything you made is so pretty, but that canvas??? Cant wait to see what cha gonna do'with the AMM kit now! You are rocking the kit! Amazing! Love them all! More beautiful work! That canvas rocks! Have fun at your friends' wedding! Ohhhh love love love the layouts!!! Wow, did you do a fabulous job! Just gorgeous. I love all those projects but I must say that canvas is TO DIE FOR AWESOME girl!